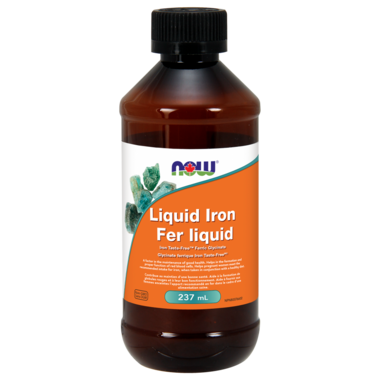 Liquid iron, also known as Ferric Glycinate, is easy on intake, digestion and can easily be made a part of any daily routine. Iron is an essential mineral that plays central roles in energy production, immune system function, neurological and general health. Iron is an essential component of hemoglobin, a molecule that transports oxygen to the cells of the body, and myoglobin, which delivers oxygen for use in muscle. NOW uses Iron Taste Free™ Ferric Glycinate, which has clinically demonstrated superior absorption, and is well tolerated as it is gentle and non-constipating. This vegetarian/vegan product is sweetened with Xylitol and Stevia so it is easy on enamel and blood sugar levels. This single medicinal ingredient formula is ideal for those wanting to take their iron separately from other nutrients. Children 1-8 years & Adolescents 9-18 years: Take one teaspoon daily with food. Adults & Pregnant Women: Take 2 teaspoons daily with food. Refrigerate after opening. (per 1 teaspoon (5mL)): Iron (from Iron Taste-Free™ Ferric Glycinate)............9 mg Non-Medicinal Ingredients: Water, Vegetable Glycerin, Xylitol, Malic Acid, Citric Acid, Potassium Sorbate, Natural Fruit Punch Flavour, Stevia Extract. great product. easy to take. got the low iron level back up.